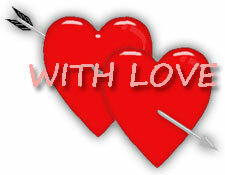 Free Valentines Day graphics and clipart of love in many forms. Love is for people and the animals, too. Page includes hearts, fish in love, elephants in love, cupid taking aim, roses, balloons, flowers, candy, teddy bears, boys and girls in love and more. 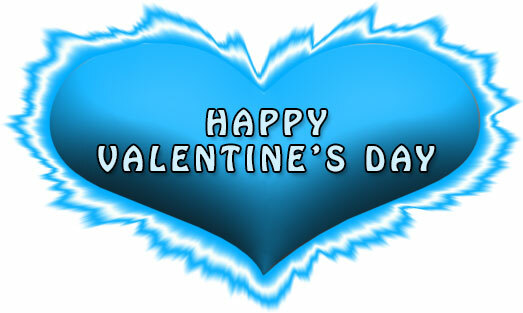 Happy Valentine's Day sign in blue - JPEG. Two young fish in love with valentine hearts. Young elephant smitten with the love bug. 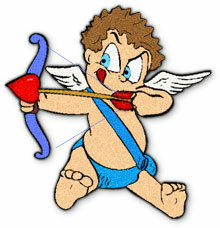 Cupid taking careful aim with his bow and love arrow. Cupid with his bow and arrow. 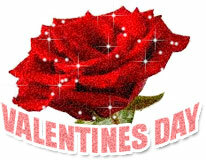 Valentines Day Rose with stars. 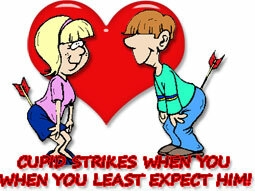 Hearts and Happy Valentines Day. 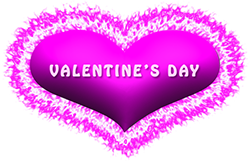 Valentine's Day heart sign in purple. Spinning heart animation with exclamation. Purple hearts and blue flowers. Happy Valentine's Day pink with blue and red hearts. code for Happy Valentines Day in pink. 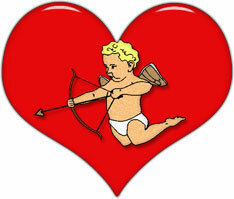 Cupid with 3 hearts and his bow. Kisses for a Happy Valentine's Day. Playing a love song animation with hearts. My heart jumps when I meet you. Roses and hearts in a vase for Valentine's Day. I Love You with a heart animation. Heart and flower with animation. Cupid likes to sneak up on his quarry. Happy heart animation with big smile. Be My Valentine animation with spinning heart. 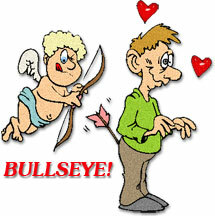 Cupids arrow hits a bullseye from behind. A valentine singing love songs. Blue hearts with star animation. Large red heart and cupid with his bow.